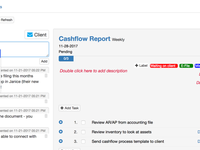 Jetpack Workflow Helps 6,000 + Accounting Professionals Automate & Track Recurring Client work. With Jetpack Workflow, you'll no longer have to worry about anything falling through the cracks. Setting up your clients only required attaching a spreadsheet. Setting up client work is a matter of setting the recurrence, and duplicating it across clients. Regain control and transparency over your client work. 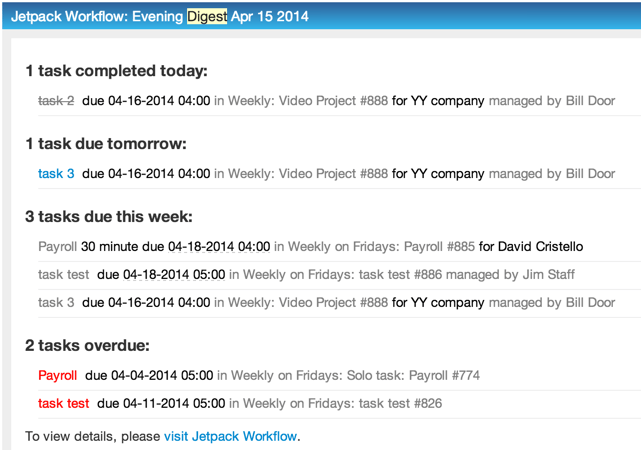 Jetpack Workflow Reviews Recently Reviewed! Easy to use!! Never miss a deadline! Pros: One of the reasons I purchased the product was because I wanted to be able to break down each job by tasks (steps). I wasn't able to do that with the previous software I was using. We have step by step instructions on how to prepare and file remittances and how to do each of our bookkeeping clients files... I always know what my team is working on by reviewing the Dashboard each day. It's super easy to get around and use. Cons: The only issue I have with this product is not seeing a period end date. Previous software we were using would show period end date as well as due date because they aren't always the same date. This is important for when we setup our fiscal year end jobs for each client. If the year-end is Nov 30th, it's not due Nov 30th. In our office we have to show the due date as 2 months after the actual year end for due date to be sent to the accountant. I would love to see each month who actually has a year end ending this month but it's not actually due until 2 months from now. End date and due date would be wonderful to see. That is my only complaint... that and it's getting more expensive each employee I add. That's one big bill to pay at the end of December all at once. I'd prefer either a monthly payment or to pay at a different time of year, not December. Pros: It allows me to rid my brain of thoughts and not forget anything. It keeps me organized and as I grow, saves me time in training and tracking my remote employees. I have a lot of recurring tasks and I like that I can set it once and then it's just automatic. It also lets me plan ahead. In the dashboard I can see what I need to work on for that day, that week, that month and helps me give better estimates to clients on when I can have something done for them. Jetpack Workflow is my key to growing a successful scaleable business. Cons: There has only been one issue I've had, which was for my bookkeeping clients I don't tend to wait on them for anything and I can start the project as soon as the month ends. I wish there was a way to automatically set the "date in" feature. The staff though, have helped me with a work around and same with other problems I've encounter. Most of the time, the "work around" is actually just a better way of doing it than what I had been thinking. Overall: I love Jetpack Workflow. I can't imagine running my business without it. They have a fantastic product and incredibly friendly and helpful staff. This package is extremely easy to use, which means that I do a better job of keeping it up-to-date. Pros: 1. I like that jobs can be quickly created within the platform. It makes it easier to set up those "one-off" jobs like tax notices or whatever. 2. I also like that you can set up a job from your email by forwarding the email to JetPack. 3. The developers listen to the users and make appropriate changes to the platform. I have made a couple of suggestions, and both were incorporated into the program. Cons: This is my fault. 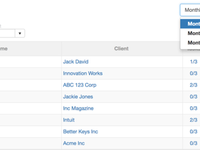 I don't always get my billing out timely, and I use JetPack to help remind me which jobs need to be billed by using a label. As a result, all of those jobs will show up under my "overdue" list. This can make it a bit cumbersome to find the real work that is overdue. Overall: It quickly shows me which projects are due today, this week, and this month. I use it to track all my tax clients from gathering information to billing. It is very easy to set up the one-off jobs so that they don't get lost in the shuffle. Thank you for the kind words - we really enjoy working with your firm and appreciate the note! Pros: We most like that this system allows us to track and control everything that moves in our office. It combines everything that we were doing with deadline tracking software, spreadsheets and handwritten to-do lists. Because we operate in a paperless environment, controlling jobs as they flowed through the office was difficult. There was no file that moved around to show you had the job. We tried using a pdf control sheet and moved it around in various folders, but that system was too loose and as bad as spreadsheets to control work. We're in our third month with JetPack and are starting to appreciate that this is more than just deadline tracking for compliance jobs. We have templates for client onboarding, responding to tax notices, year-end tax planning and some for administrative processes. As we start to customize jobs and leave more comments and instructions in the job, I feel like we're getting closer to being able to work seamlessly. We're going to use a tax preparer who is remote and are really looking forward to see how the system helps us there. Cons: There's really nothing that we find that we don't like. The worst thing I can think of is that it's easy in some entry fields to click out without checking to accept the entry. The entry is lost and has to be rekeyed. Overall: Much better control of jobs as they move through the process. We're starting to see work move easier as we get used to leaving notes and sending emails from the job screen. Pros: EVERYTHING! It is easy to use. Flexible. The GUI is very clean and simple. It keeps all my tasks and jobs organized so that nothing falls through the cracks. It provides a great way to keep track of job accountability. Everyone in the office knows exactly what they have done, have yet to do, and can check every step off as the work travels through the office process. I have provided the company feedback in the past and they have updated the software to reflect a lot of these concerns. Couldn't ask for more from a software! Cons: This is a difficult one.... I guess it would be nice to be able to modify the dashboard details to show what's important to me. For example, it would be great to just open the program and see on the dashboard how many phone messages I have. That's it... and quite frankly, it's not a HUGE deal. 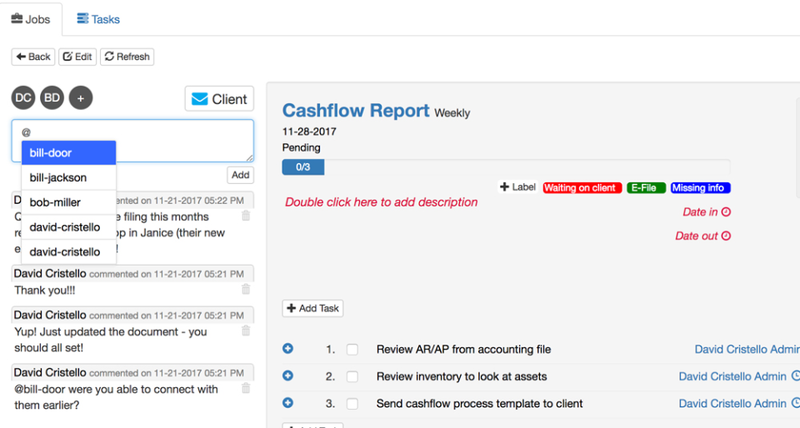 Overall: Workflow organization and accountability! Thank you Cece! We love working with your firm and thank you for the kind words! Easy to use and manage the many tasks we have in our office. Pros: Its Flexibility and the level of detail we can put in it. It is easy to filter and sort task to see what is open and what needs to be worked on. Also good ways in the software to communicate with others about issues or things that need to be completed. Cons: The exported time reports are not as easy to sort and filter as I would wish. The e-mail feature is not as robust as I would wish. You cannot embed links in it for instance or create as elaborate a signature block as in regular e-mail. Overall: Easy to manage and use, but also able to add detail to the tasks as you work on them. This software keeps us on task and makes it easy to delegate and track work in our office. Thank you for the review and feedback! These are areas I can certainly pass along to product to review, and appreciate you taking the time to send them over. Keeps track of all of my work tasks and administrative tasks in one place. Consistently. Pros: This software was designed from the ground up (to the cloud) for CPAs, EAs, and other tax and accounting professionals. But it could be easily adapted to other service businesses. Creating templates helps me to consistently and efficiently process my clients' work. It's saving me time and preventing errors. Cons: I always) regret later when I procrastinate and DON"T use it to track a job. Every time I think I don't need to record something, it causes me grief. My life gets better the more I use Jetpack Workflow. Pros: Awesome project management & easy to use; helps me stay on track with my clients and their various projects and deadlines. Customer service is great! Always kept informed of improvements and new features. Cons: I wish you could tag a client with a label in their file like we can with templates. Also, would like to see a password protected area to keep client sensitive data like username and passwords for their accounts that even JetPack employees would not have access to for security reasons. Overall: Stay on time with my client projects and easily identify what projects may need additional follow up. Thank you for the kind words Sandra! I'm going to share this feedback with the entire team! Love Jetpack. It is easy to use and keeps me organized which means peace of mind. Pros: I love the fact that I have a list of all of my clients and I can assign tasks to each client . It helps me make sure that I don't let anything fall through the cracks. I have one client that is elderly and cannot remember to pay her estimates on time. I have a tasks set up to notify her care giver to help her to pay her estimated tax. It makes clients feel you care about them and that you are on top of things. Jetpack helps me do that. Cons: I honestly have to say that at this point in time I do not have anything that I do not like about this software. Thank you Janet! We love working with your firm and look forward to your continued success! 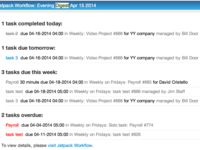 Jetpack provides an adaptable, functional work flow program. Pros: Ease of use / adaptability. Quick answers for questions. Email follow-up and tips. Great video training. Cons: In the search function, if your not careful you'll enter info on the wrong client. The search box (until clicked) will show one client name and lower data entry screen will still be on the previous. Thank you for taking the time to write a review- it means the world to us. As we continue to roll out improve functionality, we'll certainly pass along these points to the development team. I have tried many task management programs and this one is the best I've found, in my opinion. Thank you for the review Kristin! Really appreciate the feedback on where we can improve as well! Cons: at times, I need to review the input and it might not seem as intuitive as I think. Thank you for the kind words Diane, we really appreciate your review and feedback! Pros: My most liked feature is custom labels. I like the colors, the customization, and the ease of adding and deleting them. Cons: I don't like that the templates are so generic. A turnkey template that I just click on or make minor changes to would be great. Of course, I have tweaked my jetpack so that now I have custom templates, but it would have been time saving when I was setting it up. Thank you for the feedback Michelle! We'll certainly pass this along to the product team as well! Switched from another workflow - even with impending tax season. So glad we did! Pros: Ease of use. Ease of everything. We implemented in January (crazy, right?). We weighed the pros and cons of switching from our other workflow and honestly, switching, importing clients, tasks, etc. was all much, much easier than fighting with the other workflow for another day. We use the labels for quick views of what's due. We use the templates (extremely easy to modify) as soon as a client walks through the door. We especially like the "little things" like sorting not only by due date but by date received so that 1040's truly are on a first-come-first-served basis. With the colored labels, we know at a glance who is ready for work and who we're waiting for so not a lot of wasted time looking for what to do next. There is honestly no hassle at all. Staff was functional within minutes, fully trained within a few hours. We saw productivity gains immediately. Pros: Jetpack has changed the way we do business. We are more efficient, never miss deadlines and look like superheroes to our clients because we are able to reach out to them and remind them of upcoming deadlines! This has allowed our business to grow and at the same time be more productive. Love it! Cons: We would love to be able to see Archived jobs attached to client files, but I'm sure that is coming in the future. Pros: I love the functionality, I love the way it looks. So many accounting softwares are incredibly boring to look at. Jetpack is a breathe of fresh air in that area. I love Task dependencies and the fact that the tasks will flow to the next person in the process automatically. My husband and I regularly work in different locations, so it is becoming a huge life and time saver as far as communicating the progress on any particular job without having to spend time having a meeting to talk abut what is going on for the week, I can just refer him to Jetpack! Cons: Don't have much in the con area yet, except maybe how my husband ignores his training and asks me 4839028439024803 questions, but that's not your problem haha! Overall: Have loved my overall experience! We are a small (3 person) firm, and I am no IT guru. I found the setup to be very user friend and the support of the software has been wonderful. Overall: We use this keep our firm and team on top of task, projects and due dates. it does a great job in keeping you in shape with a nice and user-friendly interface. Pros: Ease of use. You don't need a manual, or an IT department to make this work. Within hours of purchase we had clients uploaded and were working with the software. Most software of this type tries to do everything including tying your shoes. Jetpack is all about workflow, managing people and jobs. Cons: I wish there was a mobile interface. However, that would not deter me from purchase. The use on my phone is a bit difficult but better than what I was doing. Overall: Manage an employee group that all work remotely. I am very happy with JetPack Workflow and highly recommend this product. Pros: I love the support and training that I received when setting up my system and the continuing support is excellent. I appreciate the quick videos that are available for learning something new, or refreshing my memory. I find this appealing compared to taking a long webinar. I have been using this workflow for almost a year and many additional features have been added already. Thank you Maura! We really enjoy working with your firm and thank you for the kind words! Pros: The Software is easy to use, and it has a very simplistic overall view of the overall look of an organization on the home screen. Customer Support is second to none, they are very responsive, knowledgeable of the software and want to be apart of your team. Cons: Wish there were some more flexibility within the task dependencies. Instead of just a due date, it would be nice if you could build job dependencies off of other jobs being completed. Pros: It's a very good program to help our firm stay on top of our work and make sure we don't miss anything. Also, very easy for multiple users to collaborate on projects and jobs. Cons: One thing that I would really love is if when you email a task to a client the document attached to that job would email over with it. You can email a link of the document right now, which is a work around that works, but not as convenient as it could be. Pros: Ability to create reuseable templates which cuts down on time spent explaining processes and procedures. Reoccurrence of jobs is also a big pro along with delegation of individual tasks. Cons: Completely accounting driven. We don't use it for just accounting but you can tell this product is more geared for this crowd. Overall: Overall good. Not spectacular or phenomenal but good. It gets the job done. Pros: I love the customer support and the fact that the team is open to suggestions and makes improvements based on feedback. This program has helped bring us from manual lists to a more organized process. Cons: I would like for there to be a way to distinguish a hard deadline from a soft one and I would like a current to do list. It is difficult to prioritize without the deadline distinction. Pros: Very easy to use with a short learning curve, seems to scale nicely, and generates good reports. Cons: Some features could be improved and I wish there was a mobile app, but there's nothing crucial. Overall: Our firm grew to the point where we needed a workflow management system, but the workflow solution I had used previously (Practice CS) was too heavy and expensive. Jetpack was/is a great solution, allowing us to keep a closer eye on our capacity utilization and time spent on projects. I wish there was a mobile app and I wish we could extract some more specialized reports, but these are small items that don't detract from an overall excellent product. I would highly recommend for any firm around the same size as us (3 senior accountants and 3 bookkeepers). Thank you for the kind words and we really love working with your firm. Pros: I love how easy it is to track jobs and set up tasks. It keeps our team so organized and we rarely forget to do a task. Cons: You have to be super proactive in setting up jobs in order to keep track of them. It's great once the job is in there, but not so great when you forget to set up the job. Comments: We used JetPack for a year and then moved on to the next task management system. I found that it was easy to enter in tasks and make them recurring. 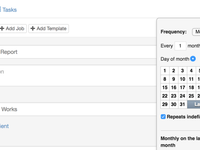 Plus with the reports, we could filter by name of task, due date, etc. We did have an issue with tasks randomly disappearing, though, which was really scary and made us lose some trust in the system. The support team was very helpful and I contacted the fairly frequently through chat and over the phone. We ended up moving on to Karbon because of the email integration, but overall my experience with JetPack was actually pretty good. It's geared toward bookkeepers, and I really liked that because things were already ready for us. Pros: We have been using Jetpack Workflow for almost a year and we absolutely love it for managing clients, projects, and tasks. Cons: The main downside to Jetpack Workflow is the lack of a mobile app for the product. I also wish that I could assign emailed tasks to an individual. One of the best pieces of software I have used - intuitive, well-designed and almost reads my mind. Pros: The developers understand this niche market of the tax and accounting profession. It shows with every step. Cons: Lack of ability to aggregate time from multiple sessions of the same job. Other than that, no least likes. Jetpack was easy to get started. Pros: The easy setup and the fact that even those who don't like computer can use it easily. I really like the dashboard because I can easily plan my day and week. Hi Kenda! Thank you for the kind words! Working with Jetpack has been an overall great experience. Cons: Jetpack only has an online product. I would very much like a desktop app that is synced with their servers so we still have our info when the internet is down. When Hurricane Irma hit us in Florida, our internet was down for a full week. We were unable to work in Jetpack. Thank you for the kind words Nancy! We love working with Fix-It Accounting, and appreciate the feedback. Pros: The best solution for our recurring internal businesses thus far. No need for a training manual, no more forgotten tasks! Cons: Nothing really... If I had any suggestion is to make edits to recurring jobs less cumbersome. They do not save if you edit the task, you must edit the entire job. Overall: Great, we love it!!! Pros: easily connect to Quickbooks, Microsoft 365, and other software. Easy to change and customize according to firm size and needs. Cons: The software has so many features that it can get overwhelming to learn. BUT, the team is only a chat away. They are great at helping you get set up and offer many training webinars. Thank you Becky! Really appreciate the kind words and support! Excellent software for the bookkeeping/accounting industry. I don't miss a deadline. Pros: Cloud based and task oriented which makes my life easier. I was concerned before I started using this program that I would miss deadlines. Would highly recommend. Cons: Small learning curve at start to ensure setup is correct. Getting acquainted with terms used in the program. Overall: Ensures I don't miss deadlines for government remittances and other time sensitive jobs. Pros: Filter functionality. Easy to create a new task/job. Great for a high level review of jobs that need to be completed. 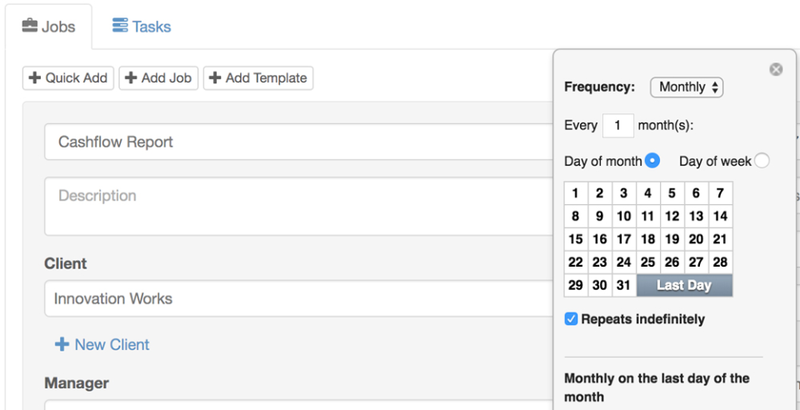 Easy to do bulk changes and create a job and assign to multiple clients. Cons: Jetpack is a bit expensive for us, but in line similar products. Mobile app would be a great add-on. Overall: High level view of clients and jobs, resulting in more peace of mind. Pros: Excellent customization software that incorporates tagging, recurring tasks, extensions, and automatic tracking/notifications for all staff members/clients. Cons: The service has improved tremendously, but the user interface is still a bit overwhelming for older staff that aren't computer savvy. Excellent tutorials on all features. 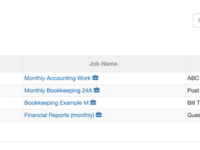 Comments: If you're an accounting firm, or bookkeeping firm, this tool could be a great fit. The service is exceptional, and the Founder actually implements the feedback. but he mentioned that that is on their product roadmap.